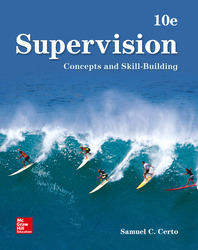 With the 10th edition of Supervision: Concepts and Skill-Building, students will learn the critical role of a supervisor in an organization and the abilities needed to be successful. The 10th edition addresses the issues supervisors face in a challenging modern workplace - change in organizational structures, diversity in the workforce, and computer and communication technology - and the role of the supervisor as a leader in meeting these and other challenges is more prominent in the 10th edition. The leadership chapter has been moved from Chapter 8 to Chapter 2, and new leadership boxes have been added to each chapter. CONNECT: A highly reliable, easy-to-use homework and learning management solution that embeds learning science and award-winning adaptive tools to improve student results (applied and practical, results-driven technology). Part 1: What Is a Supervisor?